We are bombarded of late by the news of men abusing their power. It can be overwhelming to listen to story after story after story about how men treat women. It is important to remember how many extraordinary women there are and many of them work in the wine industry. As I was thinking about this, I was reminded about my visit to Chêne Bleu Winery earlier this year. Located in the Rhone Valley, with one foot in the northern Rhone and one foot in the southern Rhone and at the crossroads of four appellations: Gigondas, Cotes du Ventoux, Cotes du Rhone and Sequret, Chêne Bleu Winery is the project of the Rolet family. Xavier and Nicole Rolet purchased the property in 1993 and spent the next 10 years restoring and renovating the 340-acre estate to include vineyards, the winery and Le Verrière, the former priory that now offers guest bedrooms and suites. And, while Xavier (proprietor), and his brother-in-law Jean-Louis Gallucci (winemaker, cellar master and chief problem solver) are both key members of the team, at the heart of Chêne Bleu Winery is a team of extraordinary women. I first met Nicole Sierra-Rolet of Chêne Bleu in 2015 when she was visiting the U.S. We hit it off immediately. She is charming, talkative and passionate, and I was engaged as she told me the story of the winery. I have had the pleasure to see her a few times over the past two years, at food and wine festivals and return visits to Los Angeles, but it was visiting Chêne Bleu last April when I understood her passion so clearly. Sierra-Rolet was born to an American mother and a French/Italian father and was raised in New York and Milan. She had an established career in international relations, public policy and finance before she caught the wine bug and subsequently trained at the Wine & Spirit Education Trust and at UC Davis. Today, she is the “senior plate spinner” at Chêne Bleu, where she manages everything including international sales and marketing of Chêne Bleu and the educational development at La Verrière, which hosts wine-related exchanges, seminars and academic workshops. She is also the co-founder of the International Grenache Symposium and Association and hosted the first world Summit of Grenache in 2010. Sierra-Rolet is energetic, driven and committed, and at Chêne Bleu this energy flows from the top down. From the first time I met her, she was very clear about the family motto “not mine, not yours, but ours.” And while Chêne Bleu is a small family business, there is a team of intelligent, well-trained women who make it what it is. Bénédicte Gallucci, Xavier Rolet’s sister, is the vineyard manager at Chêne Bleu. Gallucci had been living in Nice, France when her brother purchased the property and asked her and her husband to look after it. Gallucci had been working in tourism and her only experience in wine was working for a wine merchant in England when she was young. She came to the property where she learned from a man who was working there, and then learned from working with different consultants. She loved being outside and went back to school to study viticulture while raising her children. She now runs the vineyard where she knows each vine individually and also knows how to fix a tractor while her husband and son are in the winery making the wine. Gallucci’s vineyard team consists of women. Patricia Poiré has been helping in the vineyard, first in a temporary position and now is a permanent employee. Gallucci pointed out that she has always been there when they needed help and is a key part of the team. Gallucci’s technical consultant in viticulture is Edith Ebersbach. 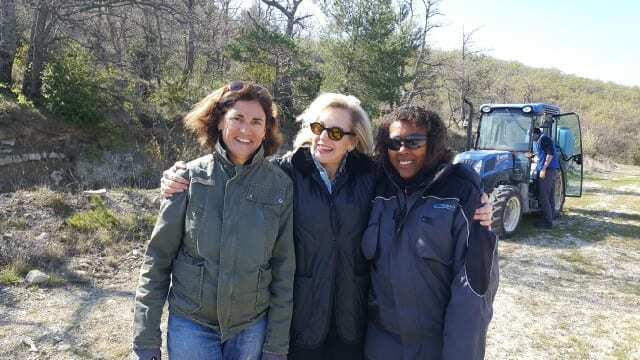 And when it comes to seasonal help, Gallucci elicits the help of local women to help with the vineyard treatments. Iverson and Sierra-Rolet met through mutual friends. An American, Iverson, who received her MBA from INSEAD (the acronym for the European Institute of Business Administration) in France, was living in London and overseeing new brand development and sales strategy for Beringer Blass and later Foster’s Wine Estates in Europe. More than a decade ago, she and her husband took a weekend trip to the property in the Rhone Valley and by the end of the weekend, the name Chêne Bleu was born. She spent the next two years working with Sierra-Rolet on branding. Iverson has been an integral part of the Chêne Bleu team since the first vintage. Today, she is the head of sales where she advises on sales strategy and actively represents Chêne Bleu in the United States. Lizzie Shell is the general manager of Chêne Bleu. Working as a real estate attorney, she was laid off in 2008 and shortly after that fell into wine. Based in London, she completed WSET Level Three before meeting Sierra-Rolet at the International Wine Fair’s Inter-Rhone booth. Sierra-Rolet was in the process of organizing her Grenache symposium at her property and they have been working together ever since. Zelma Long, one of the female pioneers in the development of viticulture in the U.S., is perhaps the foremost female oenologist in the world. Long began her career in the 1970s working at Robert Mondavi Winery in Napa and then becoming CEO of Simi Winery in Alexander Valley. Today, Long makes her own wine, Vilafonte, in South Africa and advises on a handful of selected wineries. Chêne Bleu is one of these wineries. Long began consulting at Chêne Bleu 10 years ago. 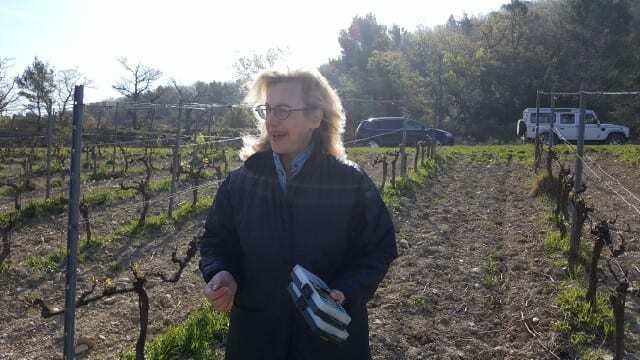 She visits the property a few times each year as consulting oenologist and mentor. When Sierra-Rolet first approached Long, she noted that it was unusual to see someone put the vineyard first. While it is easier to build a winery than a vineyard, the Rolet’s primary focus was the vineyard. Today, when she visits the property, Long applies her years of experience to help Chêne Bleu continue to improve. The success of Chêne Bleu is due to the hard work of the female team. And, in today’s world, we must recognize all of the amazing women who are supportive, encouraging and respectful of each other. 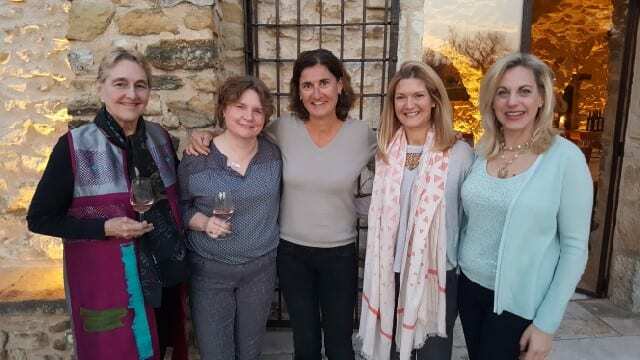 This entry was posted in Lifestyle, Wine and tagged Chene Bleu, Chene Bleu Winery, Napa Valley Register, Nicole Sierra-Rolet, Rhone, Rhone wine, Wine, women, women in wine, women winemakers, Zelma Long by Allison Levine.